THREE and a half years ago, a Holden taxi was scurrying through the streets of Brisbane. It was Involved in a serious accident and wrecked. Subsequently, the taxi was offered for sale. 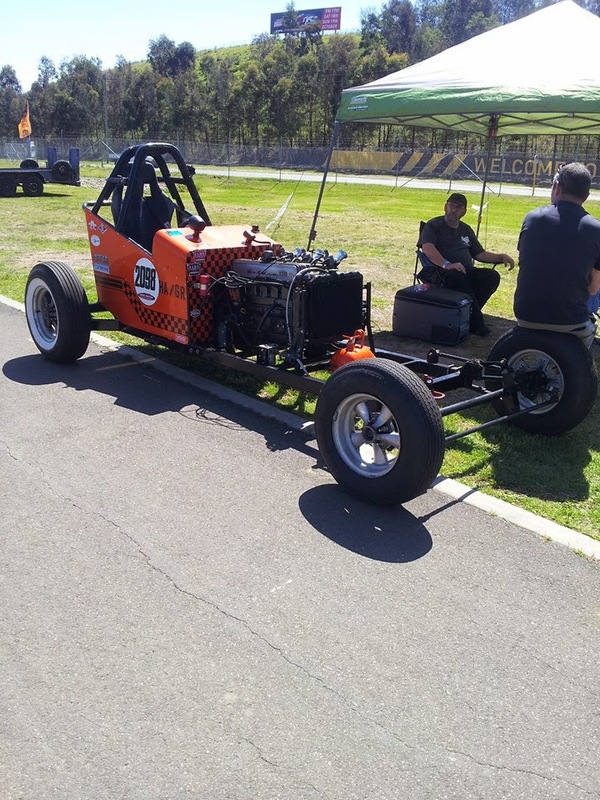 Today, a racer built from the former cab consistently shows It’s tail to shiny expensive cars on Queensland racing circuits. 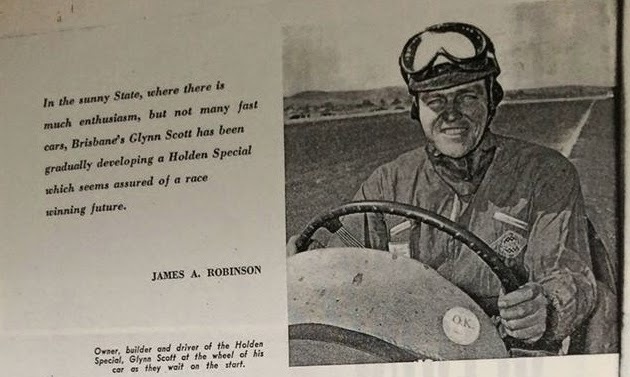 As every' Queensland fan knows, we are talking about Glynn Scott's Holden Special which in twelve meetings has Impressively scored seven firsts. three seconds, and two thirds In open handicap and scratch events. Glynn, a thirty **ears old garage proprietor of Rosalie, a Brisbane suburb, put In two years spare time work building the special, Helped by friends Max Voikers, Harry Dinte. Bill Purcell and Jack Davy, Glynn insisted that building the ear should not interfere with the formal operation of the garage, so most nights the lights burned in the workshop until the early hours. Having previously built and raced a 500cc Areil special, and being a qualified motor mechanic, It Is only natural that Glynn produced a machine which has become increasingly fast at each appearance on the track. There is really nothing extra-ordinary or revolutionary about the car. The chassis, consisting of two parallel tubes, was fashioned from 3" 16 gauge, G.P. 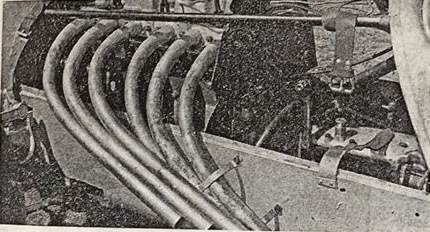 steel tubing, using Holden cross-members front and rear. The rear cross member was cut off short and normal lower control arm retained. A 11" x i" flat section cross-member was used for the engine rear mount. 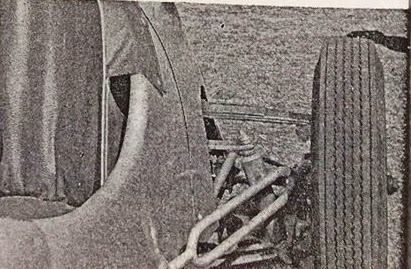 Front suspension Is conventional early model Holden, while the rear was built up similar to the Cooper set-up using a transverse spring. Normal double action tubular shock absorbers are used on the rear. leen brakes and wheels do duty on the rear while Holden brakes and wheels are used on the front. Only real modification to the Holden front assembly was the addition of aluminium fins to the brake drums. 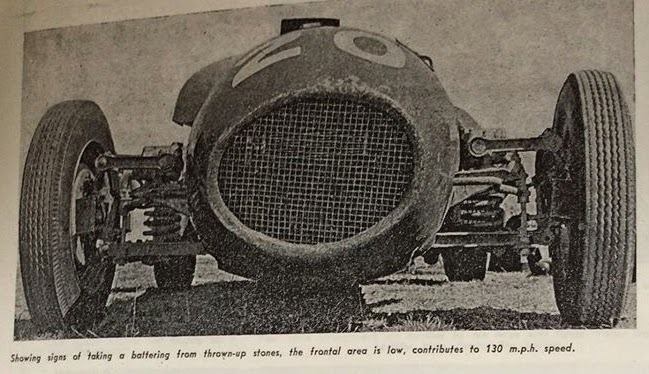 Wearing 500-15 tyres on the front and 600-15 on the rear, the racer weighs 1344 lb. on the line. 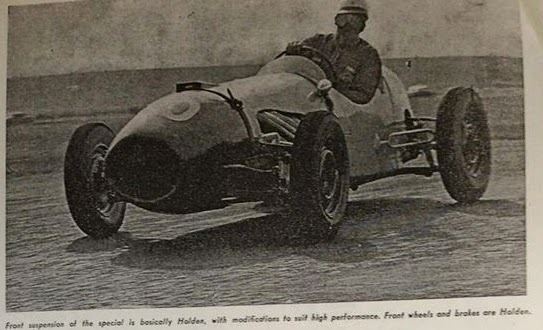 To achieve a faster effective steering ratio from the standard Holden steering setup, Glynn fit-ted a longer Pitman arm. This gives about 11 turns from lock to lock. 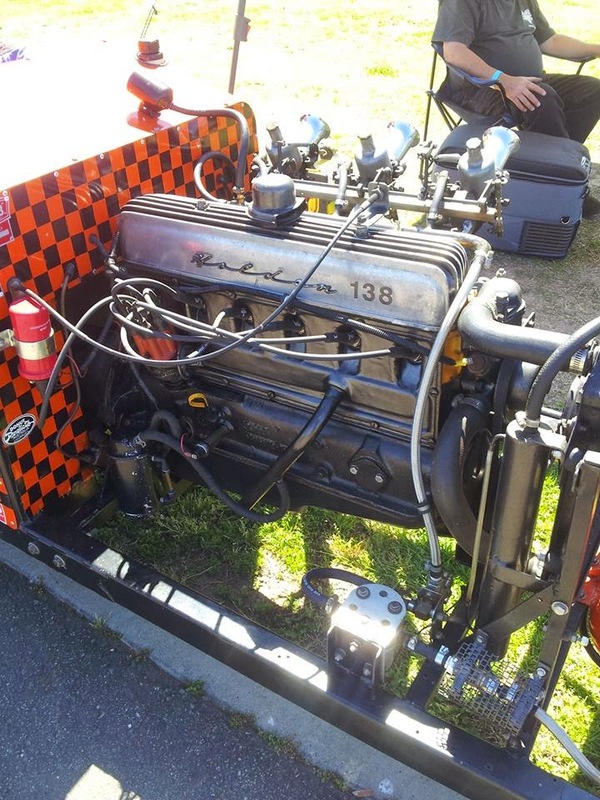 The Holden motor was bored out to 3/316", the head ported and polished and the crankshaft balanced. Copper lines were arranged to carry fuel to three S.U. carburettors. Recently a Repro Highpower cylinder head was fitted. This raised the b.h.p. from 110 with the S.U. 's to 145. still on pump petrol. The compression ratio of 8.5 to 1 remained the same. Glynn Intends to convert the motor to burn alcohol in the near future and this will give 175 b.h.p. with a compression ratio of 11 to 1. Maximum revs would be well over 6.000 but for reliability the peak will be held at 5,800. Exhaust and inlet valves are specially made, being machined from steel blanks to fit the enlarged ports. Inlet valves are 1.1" while the exhaust are 1.1" diameter. There are two springs per valve — a Chew outer valve spring encasing an M.G. inner spring. This doubles the normal Holden valve spring tension and stops valve bounce at much Increased revs. All valves are replaced after every four meetings. 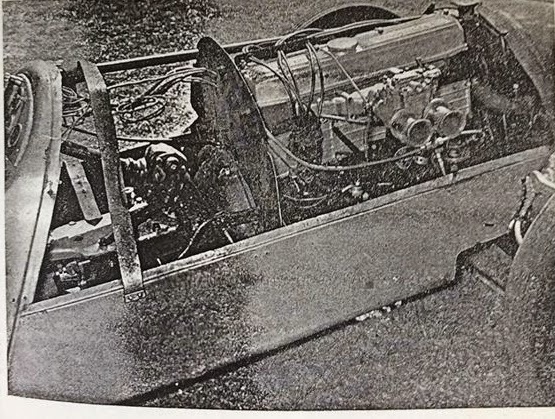 Asked about oil pressure, Glynn was a little cagey: his only comment was "We Me a very low oil pressure' The oil pump was mounted externally to eliminate driving gear failure, but despite this, Glynn has as a number of occations been forced out when in a winning position because of a sheared oil pump drive. The bug, it is hoped, will be ironed out when the gear is eventually re-modelled. 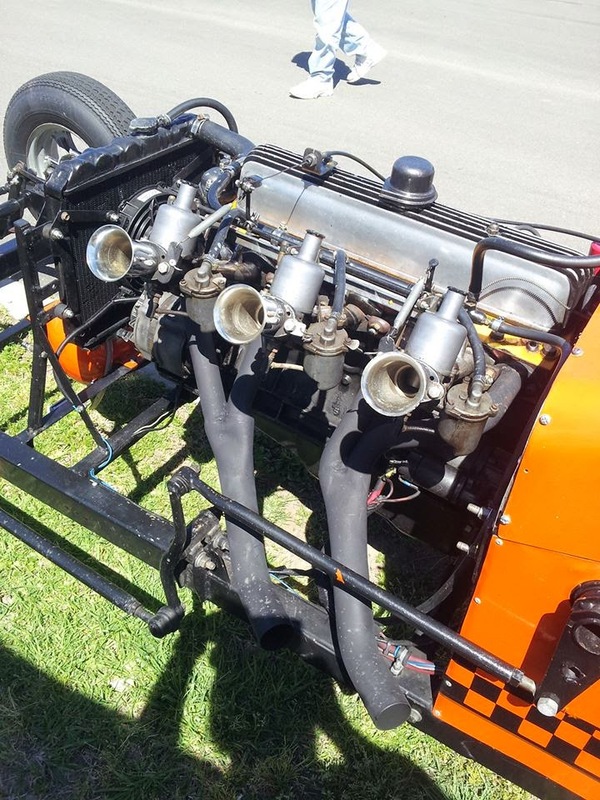 Compared with other specials, and even some factory car, the Holden Special is pretty reliable and has had only two mayor break downs — a dropped valve and a broken camshaft. Cooling is via a made-up radiator with a 3” thick core. At high speeds it was found that the Holdens water pump gave excessive cavitation. To overcome this, the rotor was highly polished and the pump slowed down. Gearbox was originally M.G. but as the horsepower was gradually increased it was found necessary to change over to a Jaguar four speed box. This has worked well and given trouble-free operation. The silver monoposto body, fashioned from light panelled steel. Is simple and functionary in common with the cockpit. The dash sports a tachometer, coil and water temperature gauges and oil and petrol pump pressure gauges. Only pretention to luxury Is the softly sprung seating accomadation, After a back injury a few years ago, doctors advised Glynn to give up motor racing to avoid jarring his back. Characteristically Glynn merely replaced the existing seat upholstery with a voluminous wad of soft sponge rubber for the June, 1956, Lowdod meeting. Climbing in he sank into the foam and began to practice. After a few laps, clouds of choking smoke engulfed the cockpit. As the nine gallon fuel tank reposed right behind the seat, Glynn braked hard and baled out at about 20 m.p.h. 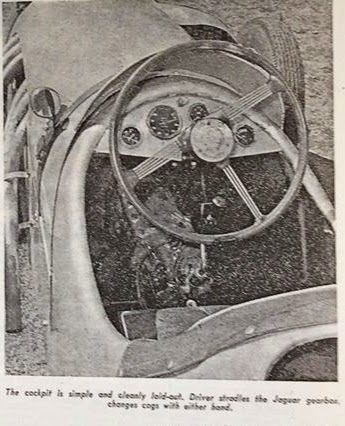 Later it was found that the weight had forced the soft rubber down on to the exposed tailshaft under the seat. Luckily the rubber merely continued to smoulder and was soon extinguished. The obvious question "How fast Is the car? 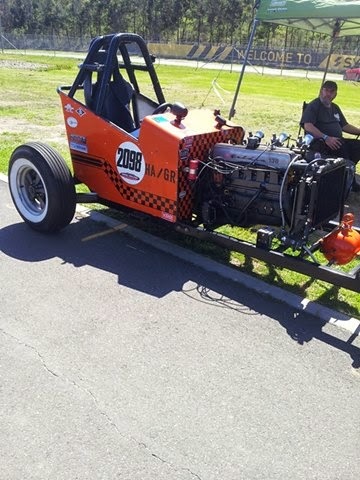 ", is unfortunately, a matter for conjecture at the time of writing The old bug, a sheared oil pump drive during practice, put the car out for the day at the Lowood Trophy meet In August. 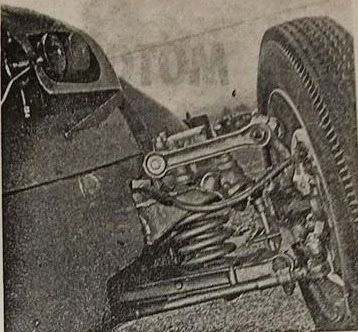 In the Queensland Road Racing Championship in June, the Holden Special, after being fitted with the Repeo head, easily ran down Arnolds Glasss H.W.M. Jaguar and later was even challenging the Anderson D-type Jaguar when the same old oil pump trouble threw Glynn out of the race. At present the car can easily attain 130 mph on a suitable circuit. Ran high 14's but was having gearbox issues and almost didn't get out of second gear the whole pass.